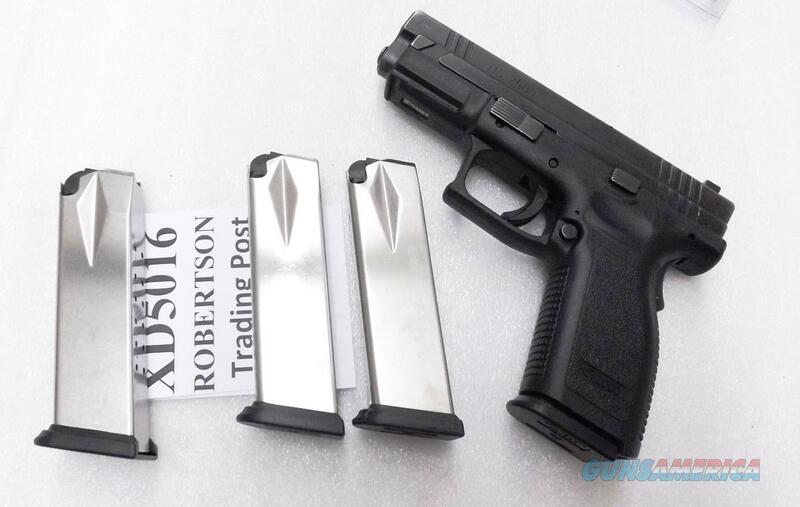 3 Springfield Armory XD 9mm Factory 16 Round Magazines High Capacity Stainless NIB NO XDM XD5016 XD9 SHIPS FREE! Description: Restrictions apply on higher capacity magazines in some parts of the United States, so please read this entire ad carefully before offering to buy. This listing is for THREE Magazines with free shipping. Add any of our other non gun, non ammo items and shipping is free for the entire order. Lower 48 Only. Here are factory Springfield Armory magazines for standard XD series pistols chambered in 9mm, that will accept a double stacked magazine. They will NOT fit an XDM or an XDS. Manufacturer is HS Produkt of Karlovac, Croatia, the same company that manufactures XD Pistols. Importer and Warrantor is Springfield Armory of Geneseo, IL. Construction is stainless steel body with round count ports and smooth milled back, steel spring and inner plate, with high impact polymer cartridge follower and floor plate. Finish is smooth bright stainless. Each magazine holds 16 rounds of 9mm ammunition: 9mm Luger, 9mm Parabellum, 9x19, call it what you will, THE 9mm. Each magazine comes in its original factory package. Replacement pricing in our area has been as high as $40 apiece on these. We’re offering 3 of these brand new factory Springfield Armory XD9 high capacity magazines, however, for only $ 42.00. Not for sale to civilian residents of Aurora IL, California, Cook County / Chicago IL, Colorado, Connecticut, District of Colombia, Hawaii, Maryland, Massachusetts, New Jersey, New York, or any jurisdiction where 16 round or higher capacity magazines are restricted to law enforcement only.